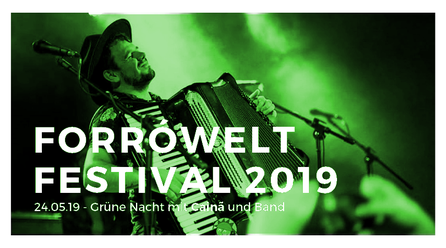 Let's start the weekend with our first international musician - Cainã, joining our festival in Osnabrück on his first tour around Europe! With his feeling for his accordion and for all the dancers for whom he plays he will fill the air of the green Alando with live music. With Cainã on stage, Rudolfo (triangle) and Leandro (Zabumba). "Todo mundo de verde no forró de hoje á noite!" 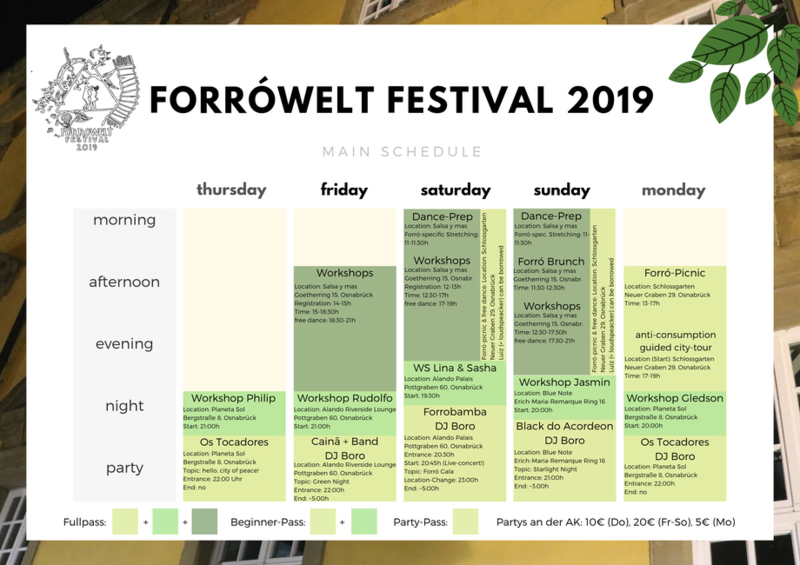 This night, we don't only want to be green in our hearts, but we want to show it: green dancing shoes, green tie, green earrings, green jeans - with these accessoires and clothing you're in! 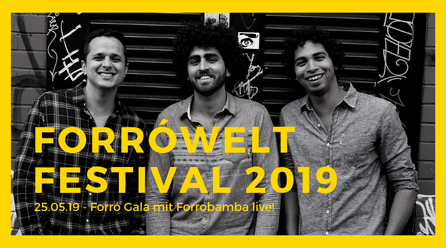 On Saturday Night, Forrobamba from London will play for us! One of the best European Forró bands will enrich our festival with energetic sounds. The musicians Guilhermino Ramos (triangle/vocals), Cassio Matheus (zabumba/vocals) and Rodrigo Vasconcelos (accordion) willl play lots of own songs mixed with forró classics. It's forró gala time, so you are welcome to dress up ;-)! Dancing in the moonlight with Black do Acordeon! Black do Acordeon from Espírito Santo (Brasil) makes our festival a part of his second tour in Europe! He is the composer and performer of some of the biggest forró hits like "Acalanto" o "Erro Eu", which can not be missing at our festival. 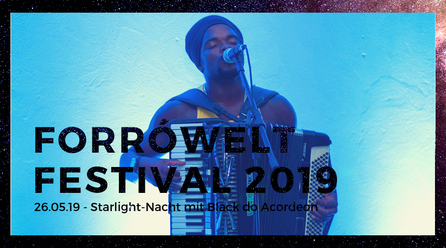 Black do Acordeon + accordion + lots of forrozeir@s + starry sky = a must for everyone! 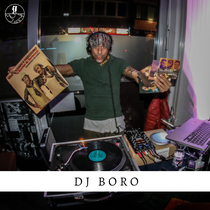 Our DJ for the Festival is crazy not only at pictures, but foremost about forró. He is from Sete Lagos (Brazil) and currently lives in Münster. It is there that he is developping a lot of forró as teacher, DJ and organizer. He mostly plays from the original vinyls of the most famous forró artists! Welcome to our FwF19-Ambassador-Team: Bruno de Carvalho! Philip about Bruno: "You should see his apartement, it is like a paradise for everyone interested DJing and forró music. Glad that he and his passion will support the festival with his music!"